Planning a summer vacation? Check out Clearwater Beach, Florida! Clearwater Beach is an award-winning beach featuring a family-friendly atmosphere, soft white sand, warm and calm ocean waves, and beautiful sunsets! 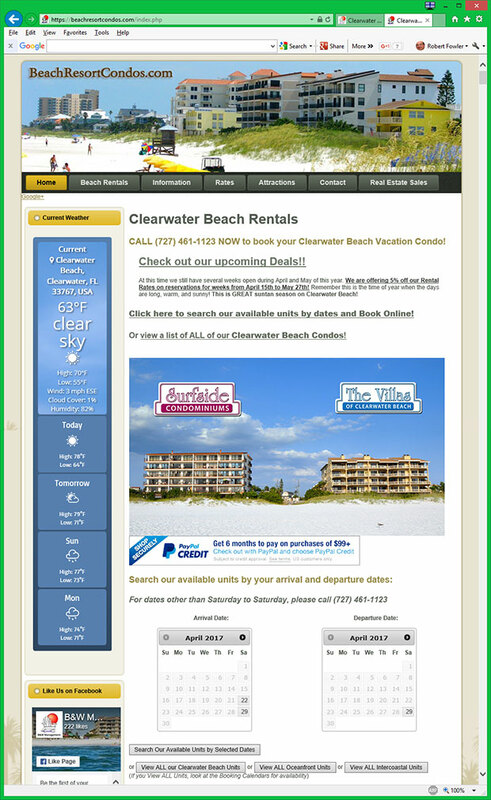 Start planning your Clearwater Beach summer vacation today! If you’re planning a week-long family vacation, check out the beautiful beachfront condos on Clearwater Beach. There are 2 bedroom/2 bath and 3 bedroom/2b bath condominiums available at Surfside Condominiums and The Villas of Clearwater Beach. These condos come with private balconies overlooking the beach, full kitchens, washer and dryers in each condo and access to the swimming pools. These condos are perfect for a family-friendly Clearwater Beach summer vacation! If you’re taking a short summer vacation, there are many great hotels on Clearwater Beach. From luxury resort hotels to fun retro style motels – and everything in between – there are many great options for places to stay for your Clearwater Beach summer vacation. It’s a beach vacation, go relax and play on the beach! Play in the sand, soak up the sun and cool off in the calm waters of the Gulf of Mexico. If you need beach chairs, umbrellas, or even Paddleboards for the ocean – you can rent everything you may need for a fun day at the beach from Clearwater Beach Paddleboard Company. Surfside Condos and The Villas of Clearwater Beach both have private pools to relax in. If you’re staying at a hotel that doesn’t have a pool, there’s also a public swimming pool at the Family Aquatic Complex on Clearwater Beach. The Clearwater Beach Marina is full of fun things to do. Head out deep sea fishing, dolphin sighting and excursion tours, jet skiing, parasailing, speed boat rides, boat rentals, sunset sails, or even dinner cruises! Catch a baseball game during your Clearwater Beach summer vacation. Head to Tropicana Field in St. Petersburg, FL and watch the Tampa Bay Rays. Or stay right in the Clearwater area and watch the Clearwater Threshers! There are wonderful day trips you can take from the Clearwater Beach area and it’s much more than just Disney World. If you’re looking for a very quiet beach, take beach hike and walk to Caladesi Island. Head just north of Clearwater to Tarpon Springs and enjoy some delicious Greek food and see the history of sponge diving in the area. Crystal River is another fun area north of Clearwater, Florida. Crystal River is the area surrounding Crystal River Wildlife Refuge, a beautiful area for kayaking around clear springs that manatees love to hang out around.